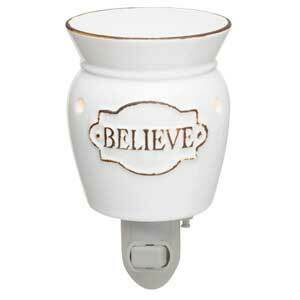 Authentic Scentsy Hope night light warmer is made of porcelain and trimmed with lace detail. The word “Hope” says it all and is written using a beautiful cursive font style. Also, at night the warmer softly illuminates the room. 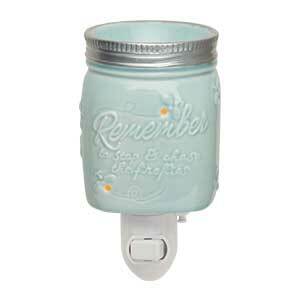 We are always amazed how Scentsy can take something so simple and make it special and beautiful. 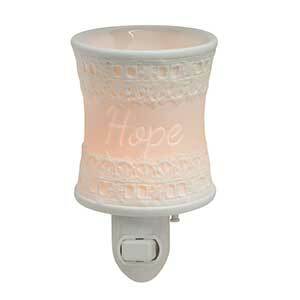 Well, they’ve done it again with this cute little Hope Night Light warmer. Don’t forget, it works as a scented wax warmer and a night light, all in one! If this isn’t exactly what you were looking for we have plenty more night light warmers from which to choose.